By Freeola Support on 12th April, 2019 | 0 Comment(s) | 0 out of 3 people found this article useful. Welcome to the Freeola Internet customer support pages. 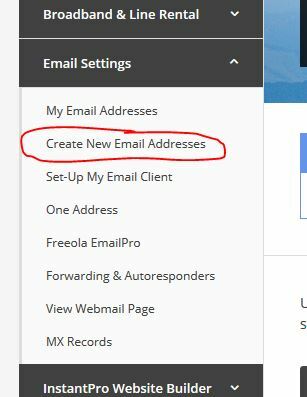 This guide is designed to help with adding or removing an e-mail address within MyFreeola. For more internet help topics please visit our main Support Page. Everything to do with email on your Freeola account is administered via your MyFreeola account. Click the Create New E-mail Addresses link from the left-hand navigation. If you have multiple domain names within your account you will now be prompted to select which you would like to add your new address to. If required, there is a search box at the top of this page to allow you to filter your list. If you only have one domain name within your account, you will automatically move to Step 4. You will now need to enter the first part of the e-mail address you would like to have. For example, if you would like the address [email protected] you would enter freeola within this field. You can create up to 8 e-mail addresses at once on this page. Should you require more addresses, simply repeat this process once you have created your first batch. The suffix (the part after the @ symbol) will have been pre-filled using your domain name, there is no need to type this again. Click Continue to move on to the next stage. You will now be asked to confirm how you would like to access messages sent to this account. If you would like to access the mail directly via a mail client or Freeola Webmail (recommended) then select I want to make full use of my new e-mail address. If you wish to forward messages to a different account, select I just want to forwarding everything.... Click Continue. 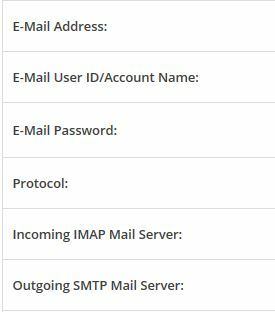 If you are using the account fully, you will be asked whether you wish to use POP3 or IMAP mail protocols. A brief description of each will be outlined on the page, simply select the option which best suits your needs. However, if you are planning on access your account on multiple devices, then we would recommend IMAP. If you selected Forwarding, you will now be asked to provide the account to which you would like to forward to. Once you have made your selection, click Continue. You will now be asked to confirm your Freeola Communication Preferences. Once you have selected from the three levels available, click Confirm then Finish to complete the process. You should now be shown a list of all the settings required to make use of your e-mail account. If not, you can view these easily from the My Email Addresses link found under the Email Settings heading of the left-hand navigation menu. Log into your MyFreeola account. Once logged in click the My E-mail Addresses link found under the Email Settings section of the left-hand navigation menu. 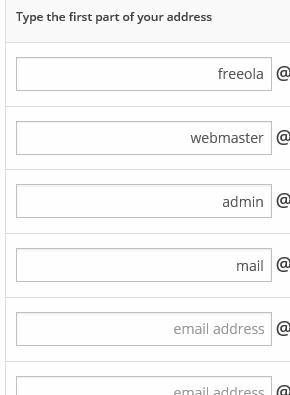 The new page will list all current e-mail addresses within your MyFreeola account. Click on the Settings & Features button next to the address you wish to delete. Near the bottom of this page will be a pink button that reads Delete Address. You will then be prompted to confirm you wish to remove this account. If you are happy to do so, click Delete My Address. The email address and all associated messages have now been deleted and you will be returned to the My Email Addresses page. We no longer allow the creation of Freeola500 addresses. If you would like to create a new e-mail address you will be required to do so on a GetDotted domain name, as advised above. Near the bottom of this page will be a button that reads Delete Address.